Woolworths and MySchool Teacher's Day Award WON! Hectic Nine-9 is a proud partner of this year’s Woolworths & MySchool Teacher's Day Competition! You, your teacher & your school could win a share of prizes valued at R450 000! In 200 words or less, write us a letter before the 31st August, telling us how your teacher has inspired you and made a difference in your life. 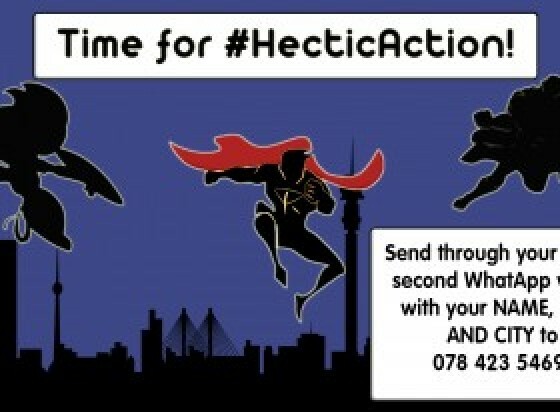 It's time for YOU to take #HecticAction! We're giving away a massive prize on Friday so tune in to SABC2 4-5PM & you could WIN BIG! All you have to do is send us a video of you, and your squad, cleaning up YOUR hood to our WhatsApp number: 0784235469. The videos can be up to 30 seconds long, but cannot be longer than 30 seconds! Please include your NAME, AGE, and CITY when you send through your entry. If you send us your #HecticAction video, you stand a chance to win a day of adventure courtesy of HN9. Make sure to include your name, age, and city in your submission, The winner will be announced Friday the 23rd. Thank you for your participation, and celebrating our 10th Birthday on Monday 2nd October with us from 4-5pm on SABC2!